The best way to explore all that Inle Lake has to offer is by boat. At Song of Travel Hostel we offer full day boat tours that will let you see the magic of the area with your own eyes. While we provide these exceptional day trips to our guests, we allow anyone to join our trips, no matter where in Nyaung Shwe you are staying. Simply reserve your spot with our reception no later than the day before your trip. We offer both a sunrise trip and a sunset trip, but highly recommend the sunrise trip for the spectacular light, breakfast, amount of fishermen you will see, and the opportunity to visit the 5 day market. For Song of Travel Guests the cost is 16,500 kyat. Guests from other hostels pay an extra 1,000 and will be picked up by tuk-tuk from their hostel on the way to the boat. While the price is a bit more than other boat organizers, our trip includes a packed breakfast to be eaten on the lake while watching the sunrise (if on the sunrise trip), as well as a huge family style lunch hosted by a local family in a floating home, where you can also experience canoeing in a small traditional teak canoe. Other boats will take you to restaurants on the lake for lunch where you will pay high tourist prices for food and drink. On the morning of the boat trip, you will be picked up for the sunrise from the hostel at 5:30 am by a friendly tuk-tuk driver. Don’t worry, we offer wake up calls. You will be driven down to the local jetty where you will board your boat. The group may be split into two boats depending on the number of people participating, but the boats will stay together all day. The boat makes its way along the edge of town, offering a memorable pre-dawn view of pagodas, markets, and monks. It is chilly this time of day, any time of year, so bring a warm layer. The boats also have enough blankets for every passenger. As you reach the lake you will see only a few other boats out, mostly carrying locals at this hour. You will pass local fishermen, both traditional and more modern. The traditional fishermen you see, with large bamboo conical nets, may not actually be fishing. Most of these traditionally dressed men are actually waiting for groups of tourists to pass by so they can pose for photos. These men are expert models and give photographers great material. They do expect tips for their performances. Our boat drivers don’t stop for these showmen, though you will likely still see some from a distance. You will certainly see actual fishermen out working. They still use their legs to paddle the boat but instead of the large bamboo cone they gently lay down nylon nets. They may or may not be wearing traditional clothing, but they are still interesting and photogenic, and important members of the Inle Lake community. As the sun begins to illuminate the sky from behind the eastern mountain range your boat will park along the floating gardens. The drivers will serve you Shan tea while they assemble your breakfasts. Breakfast consists of vegetable steamed rice, wrapped in a banana leaf, and vegetable samosas, as well as a banana. As you eat you will see the sky glow in beautiful reds and oranges as the sun dramatically emerges over the mountains. This is likely to be one of your most memorable breakfast experiences. From the floating gardens at sunrise you will be taken to a local silversmith shop on the lake. A local will great you at the dock and welcome you inside where she will explain the origins of silver in the region and take you through the workshop where you can see silver being melted, purified, shaped and delicately worked into beautiful jewelry the local traditional styles. The shop is almost like a museum of local styles of silver jewelry from the various tribes of Shan State. It also holds a collection of precious stones from all across Myanmar. You can also find local puppets, wooden and brass sculptures, and various other traditional crafts. This is a great place to pick up souvenirs and gifts, but there is no pressure to buy anything. 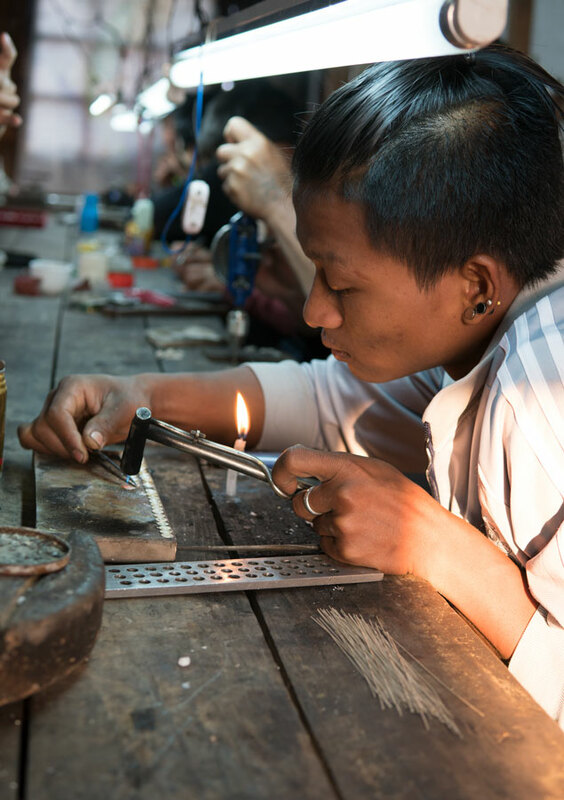 From the silversmith you will ride through a floating community to arrive at a lotus weaving center in Paw Khon Village. You will see how the local women create strong silken threads from the fibers of a lotus stem. You see how much time and work goes into creating the threads from which local textiles are made. Because the lotus thread takes so much work and so many lotus plants, it is very expensive and locally is generally reserved for making robes for monks. A small scarf requires about 4,000 lotus stems, while a monk’s robe can use more than 220,000 lotus stems. You will see women working large looms, creating scarves and longyis, the cylindrical sheet of cloth worn like a skirt by both Burmese men and women, from silk and cotton. You will pass through a room where the lotus, silk, and cotton fibers are being dyed in natural pigments like tree bark, leaves, seeds, and jackfruit. There is a shop attached to the workshop where you can browse many handmade textiles and clothing. It is impressive to see the final pieces after learning how much work goes into making every strand. The next destination is the 5 day market. The location of the market changes every day throughout 5 villages of Inle Lake. They are all accessible by boat and will have the same vendors selling the same products. The entrance of the markets usually have stalls selling handicrafts and trinkets geared towards tourists. As you walk further into the market you’ll see the rows of booths crowded with locals. There are stalls selling tea leaves and dried herbs, brightly colored spices, medicines, fruits and vegetables, sewing supplies, chicken, fresh fish, some still flopping around. This is where the locals come for nearly all of their supplies. There are small food stalls and tea houses tucked into the isles of the market, which are a great place to sit and watch all of the activity. Save room for your lunch, though. From the market you are taken to a nearby cigarette and cigar shop. Here you will see the entire process of cigars, locally called cheroots, and cigarettes being hand rolled. There are usually a few women working at a time, each ones hands moving faster than you can imagine. The average worker rolls 500 each day. One woman who has worked there more than 40 years rolls closer to 1,000 cigars a day. Both cheroots and cigarettes are wrapped in thanat leaves, which are grown in the mountains. 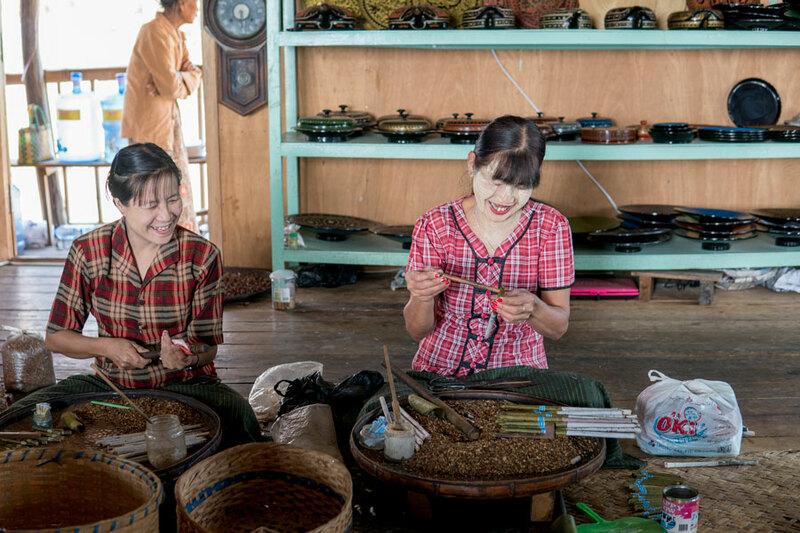 Inle Lake is known for its variety of tobacco flavors in their cigarettes. While they do have plain tobacco options, you can also try tobacco flavored with cinnamon, banana, star anise, cloves, or mint. You are welcomed to sample any or all of these flavors at the shop. By this time you have likely worked up an appetite. 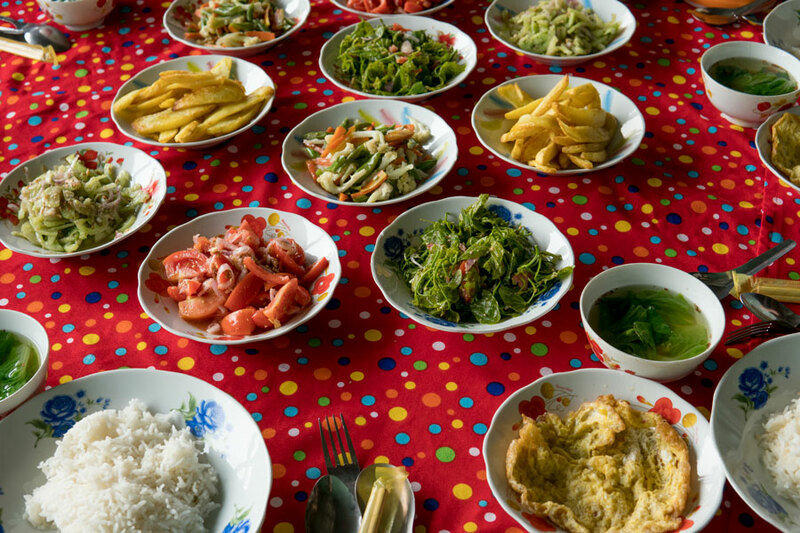 You will be taken to the home of a local family where you will be greeted with tea and tealeaf salad while lunch is freshly being assembled. You can speak with the host and ask questions about the community, culture , daily life, etc, or just enjoy the views from the many windows. You will move in to the next room where you will together on the floor around a large table that will be covered in food. The first courses are all vegetarian. You will enjoy a variety of salads, including a tomato salad, cucumber salad, watercress salad, roasted vegetables, and french fries. Each person is given a generous bowl of rice and a fried egg omelette, and a tofu noodle soup. Hopefully you save some room, as the hosts bring out a fish, freshly prepared in the local style, for each non-vegetarian guest. After the meal watermelon is brought out. You are encouraged to try thanaka, the pulp of a local tree bark used on the face of nearly every person you see in Myanmar. It works as a natural sunscreen and you may appreciate it on the rest of your boat trip in the mid day sun. From the home, you are taken on traditional Inle Lake teak canoes, smaller than the boat you arrived in. There is no motor and you can try the traditional foot rowing technique used by the locals. When you return to the local home you have about 20 minutes to rest and let your food settle before returning to the lake. After lunch you will go for a scenic ride on the lake and down the Inn Thein Creek to reach the Indein pagoda complex. The journey itself is relaxing and you can enjoy quiet corners of the Inle Lake area. You will see farm workers and monks bathing in the creek and buffalo catching a refreshing splash. There are a number of footbridges you will pass under on your way to Indein, often with monks crossing. You’ll get dropped off at the bottom of the hill leading up to Indein. The path uphill is basically a covered market area. Depending on the day there may only be a few souvenir sellers or the entire path may be lively with packed booths. You will see stupas on both sides of the walkway along the way up. Some of the older, more interesting ones can be found towards the bottom of the hill on your left. As you reach the top of the hill you will see mostly new stupas made from white stone and/or concrete with lots of gold decoration. The last stop of this full day tour of Inle Lake is the Maing Thauk Bridge. This 500 meter teak walking bridge was built to connect two parts of the village and allow quicker access for some to the 5 day market when it is held in the Maing Thauk village. You can walk as far along the bridge as you’d like, or stop in one of the bars along the bridge for an afternoon beer before making your way back to Nyaung Shwe and Song of Travel Hostel. The ride home is quick. The occasional splashes of water will likely be refreshing in the afternoon sun. Most people are pretty tired at this point, having gotten up so early and filling the day with so many different sights and experiences. You will return to Song of Travel around 4 or 4:30 pm with photos, memories, stories to tell, and hopefully some new friends. The sunset boat trip around Inle Lake is very similar, but it departs the hostel at 10 am and returns after the sunset, around 6:30 pm. While this trip does not visit the 5 day market, it does visit an old British meeting house from the early 1900s. 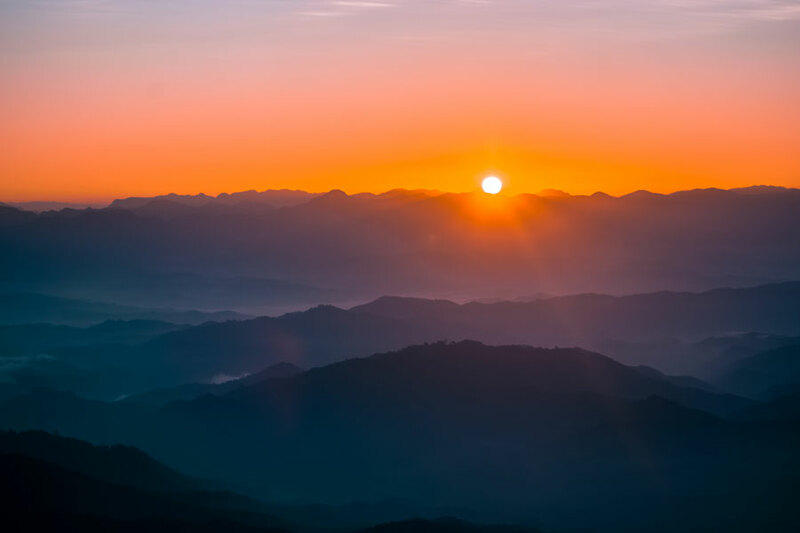 While we recommend the sunrise tour, you will not be disappointed with either. This is an experience not to miss! There is no better way to discover the treasures of the Inle Lake area than by trekking. Luckily there are a number of possibilities for trekking Inle Lake. Song of Travel Hostel at Inle Lake offers a one day trekking trip around the mountains east of Nyaung Shwe. The trip can be slightly customized depending on what the group wants to see. The group leaves the hostel at 8 am. In the mountains you will encounter some of the most stunning views of Inle Lake and see few, if any, other tourists. You will be provided a bottle of water and will stop to enjoy lunch together in the home of a local hill village family. The average journey is about 22 km and arrives back to the hostel between 3:30 and 5:30 in the afternoon, depending on the pace and interests of the trekkers. The guide is one of the local staff at Song of Travel, familiar with the area and with strong English. Many people arrive to Inle Lake after a 2 or 3 day trek from Kalaw. You can easily catch a bus from most cities in Myanmar to Kalaw. While you can start the trek around sunrise after arriving by overnight bus, Kalaw is a lovely town to spend a day or two. It was founded as a British station during colonial rule. It is located in the hills at 1320 meters (4330 ft.) elevation where the temperature remains cooler than the rest of the region. There are many lovely day walks you can take around town where you will see friendly locals, flower and vegetable gardens, and remnants of the British colonial era including an overgrown golf course and crumbling colonial mansions. You can walk up hill to the Thein Taung monastery for lovely views of the whole town. On the 2 day trek from Kalaw to Inle Lake the first day begins by walking through villages of Pa-O people. You’ll see them working in the rice fields and farming mustard, garlic, corn, ginger and chiles. This is a great way to observe the local people as they go about their daily lives. Locals are friendly and you’ll find most of them smiling at you. The group will stop at Kone Hla village for lunch and later Pattu Pauk for tea before arriving at Htee Tein monastery where the group will spend the night. The second day begins with breakfast served at the monastery and meeting with the head monk. The trekking will be all downhill after the first 30 minutes. The group stops in Indein village for a local lunch and amazing views of Inle Lake below. After lunch you hike down to the lake where the group will board a boat for an afternoon ride across the lake to reach Nyaung Shwe, where you will find Song of Travel Hostel. The 3 day trek includes an extra day in the beginning, where you will see more villages of both Pa-O and Danu tribes. The first night you will stay at a local homestay. The second night you will stay in the Htee Tein monastery. There are many trekking companies based in Kalaw where you can book your trek. Jungle King and Ever Smile are two reputable companies who always have trekkers safety in mind. Your packs will be delivered to the hostel before you arrive, so you have less to carry. If you are planning your trip to Inle Lake we highly recommend looking into a trekking adventure to arrive here. You will meet new and interesting people, experience moments of life with the locals, and see incredible views most tourists visiting Inle Lake miss. 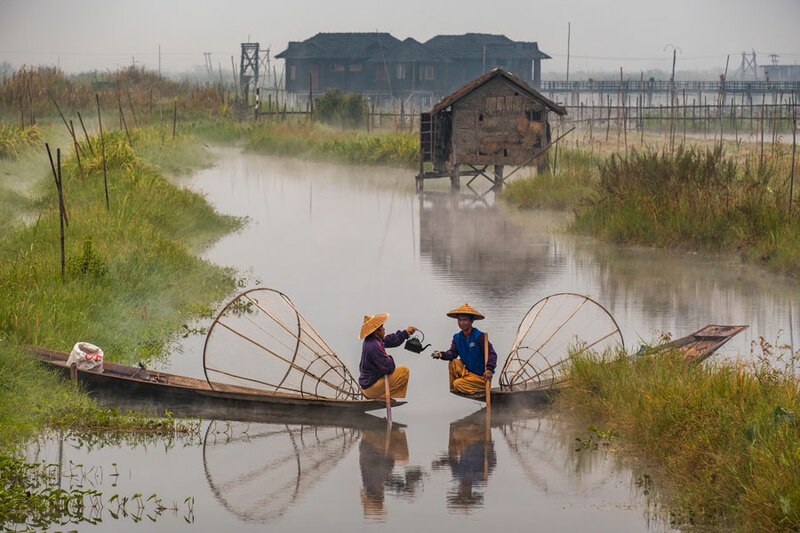 Inle Lake is a an enchanted area in Shan State. 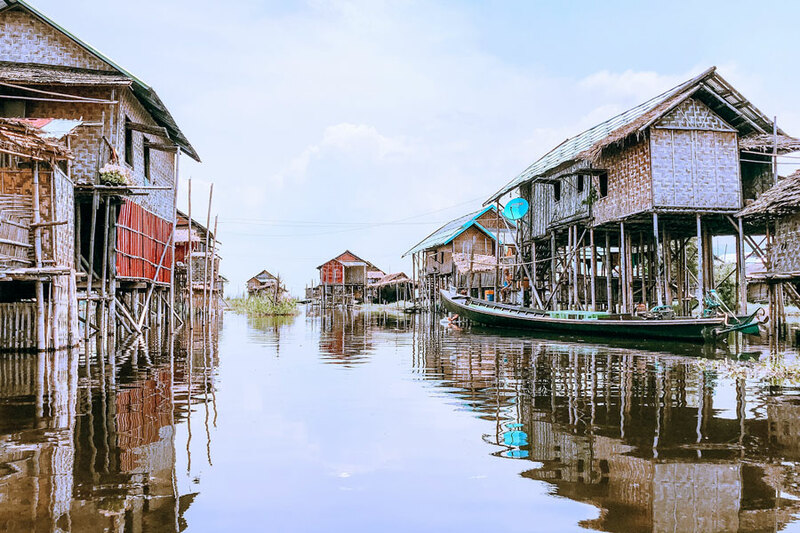 Most people have seen the idyllic photos of the traditional fishermen and floating villages built on stilts. There are countless treasures off the beaten path, however. We encourage you to try cycling the loop circuit around the lake area. We welcome guests to take our bicycles out for adventures and sights many people will miss. Here is a guide for cycling around Inle Lake. Before sharing the impressive sites, it is important to note that it can get really hot here. We recommend taking bike trips in the morning. It stays nice and cool until almost noon, even in the hot season. It also tends to cool down after 4pm if you’d prefer an evening ride. Always bring a sunhat, sunscreen and water with you. In rainy season it is advisable to bring a raincoat, as storms can appear any time. One of the closer destinations to Nyaung Shwe, the gateway to Inle Lake, is the Shwe Yan Pyay Monastery. Shwe Yan Pyay monastery is 4 km (2.5 miles) from Song of Travel Hostel and directly north of town. It’s incredibly easy to find. From the hostel you bike down the main road in town, Yone Gyi Street, until you reach the market. Turn right on the street just past the market, Shwenyaung - Nyuaungswe Road, and continue straight along Tharzi Pond until you reach the monastery. It should take the average person 20 minutes to half an hour to arrive there on bike. Shwe Yan Pyay monastery is special because it is 150 years old, made of teak and has large, uncommon oval windows. It was built to house poor boys from the area who will become novice monks when they come to live here. The monastery contains a shrine that holds well over 100 Buddha statues in small niches in wall, illuminated by candles. This monastery is not often visited by tourists despite its proximity to town, and has a unique, peaceful atmosphere. To the South West you can find a number of interesting sights. The two most popular are the Khaing Daing Hot Springs and Khaing Daing Village, also known as ‘Tofu Village’. To reach these destinations take the main road in town (Yone Gyi Street) south and cross the bridge. Follow the sometimes winding road along the local streets and rice fields until you come to a T and can no longer go straight. Take a left and continue for about 4 km, until you see a sign for Khaing Daing Hot Springs on the left. 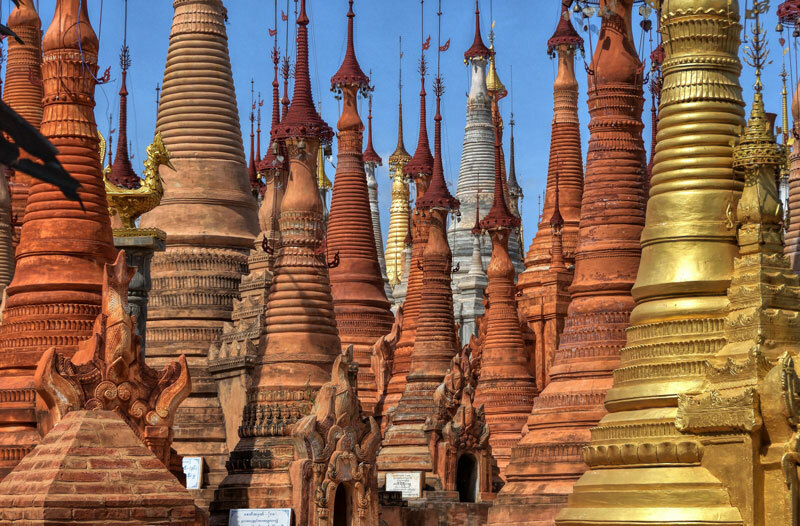 You will pass Innoo Pagoda, a collection of beautiful golden stupas, on your way and it is definitely worth visiting. When you enter you will be guided to 3 pools that have recently been built for tourists and charged about 15,000 kyat to use them. You can choose to join the locals in the original pools, in which men and women are separated, for 7,500 kyat. 15 minutes beyond the Inle Lake hot springs is the ‘Tofu Village’. 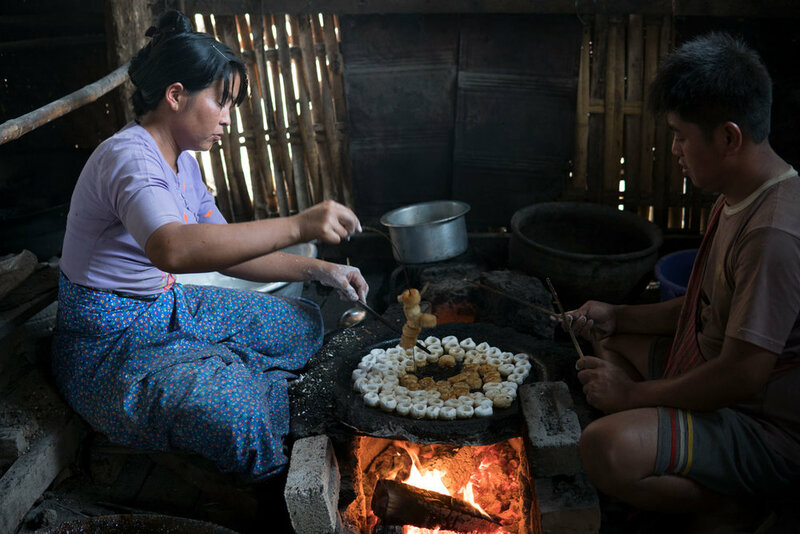 This small community is comprised of families who each specialize in making different foods, including the tofu for which the village is well known. Other treats include local candies make from brown sugar harvested from local sugar cane, fried crackers, rice crackers, seasoned seeds and nuts, and ‘happy water,’ or home distilled rice wine. Upon arriving to the village you are taken on a free tour where you see the families producing the snacks and you’re able to sample all of them. Come hungry because they share a generous amount of food with you. Refreshingly, there is no pressure to buy anything. There is not even a shop. You are welcome to purchase snacks from the families, but you’ll have to ask your guide to facilitate the transaction. After the tour you are given more snacks and are able to ask any questions you have about the village, area, culture, government, or whatever piques your interest. It is a great opportunity to have a real conversation with a local. Though they don’t pressure you, donations are encouraged. The suggested donation is 3,000 kyats. The money the village earns is pooled together to pay for schools and roads and the new sustainable tree farm to power the ovens used to create all of the foodstuffs. After visiting, chances are you will feel really good about leaving a little bit of money with these lovely people. From Tofu Village, also known as Tofu Palace, you can take your bikes on a boat across the lake. Negotiate with the drivers, but the average price 10,000 for 2 people and 2 bicycles on the boat. The boat driver will drop you off on the east side of Inle Lake near Maing Thauk Bridge. From there you can bike to the Maing Thauk forest monastery for amazing views of the lake before riding north 6 km to the Inle Lake natural swimming pool. On the way back towards Nyaung Shwe you will find Red Mountain Estates Winery & Vineyard. It is only 3.5 km from the natural pool and about the same distance from the hostel. You will see the sign for the winery and turn right. There is a covered area to park your bikes as you walk up to the winery. Wine tastings are 5,000 kyat for 4 local Burmese wines of Inle Lake. 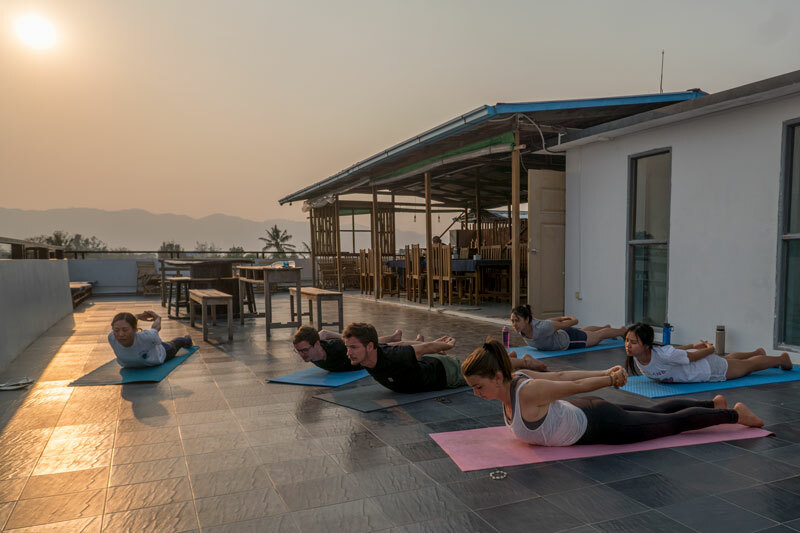 You can also order wine and food in the restaurant and stay to watch the sunset over the mountains and Inle Lake. It’s a stunning sight. If you want to see more before returning to Song of Travel hostel, you can visit the Htet Eain Gu Cave Temple and Monastery. This cave is located 2.7km east of the hostel and is very easy to find. From the winery continue north towards town until you reach Yone Gyi Street. Continue on this road until you reach Bamboo Garden. From there you will probably want to park your bikes and walk uphill to the cave. The path will be marked. If you are going to the Cave from the hostel turn left from the hostel doors. At the second intersection turn right. Continue until the 5th intersection where you will turn right on Yone Gyi Street. Out of respect to the culture, please cover your shoulders and your legs when entering the cave. You will find hundreds of Buddha images and figures inside this cave and are likely to encounter monks and few other tourists, especially the earlier in the day you go. These are only a few of the sights that can easily be explored by one of our free bikes in Inle Lake. Ask our knowledgeable staff about other lesser known routes and destinations if you are up for an even bigger adventure! 4. Walk up hill for an amazing view! 6. Tofu Village - see how locals produce their food. 7. Boat across the lake! 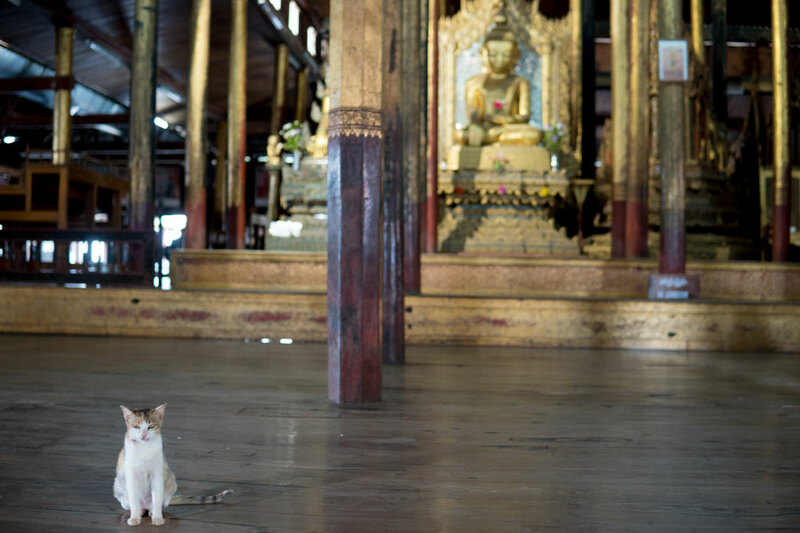 Myanmar is full of famous Buddhist structures and you can see every kind right here in Inle Lake. Do you want to learn the difference between Stupas, Pagodas, and Temples? Here is a quick guide to understanding the differences. If you want an experience off the beaten path at Inle Lake we highly recommend a visit to the Tofu Village. 13 kilometers from the hostel, Tofu Village, also known as Tofu Palace is a great half day excursion from town. It takes 45 minutes to an hour to get there as you bike past rice fields, monasteries, hot springs, and the lovely Innoo Pagodas. The village, whose real name is Khaung Daing, was originally inhabited by the native Intha people, but is now home to a healthy mix of people including Taungyo, Pa-O, and Danu. It is home to around 300 people whose livelihoods come from different foods made and sold at local markets. It is known for its tofu, made from yellow chickpeas, and very popular in local cuisine. When you arrive to the village you will be greeted by a village member who will sit you down, pour you green tea and feed you a variety of local snacks. They will tell you about the village and the products they produce based on what grows well in their gardens. You will also learn how this close knit community pools together resources to better the village. Then the free tour begins. The tour starts by visiting a family who produces tofu. The entire family is involved in the process, which is more complicated than one might think. Extra steps are taken in the local tofu production which results in a soft, texture, almost creamy in some forms. They produce four varieties of tofu: fried tofu, cubes for curry dishes, tofu crackers, and a “fresh” tofu, mostly used in a local tofu salad. You get to sample them all! Tofu has been produced in this village for over 80 years. You are also taken to see families making a variety of other treats. One family makes crunchy crackers that look like fried noodles made from rice flour, corn flour, and chickpea flower. Another makes a traditional candy make from brown sugar harvested from local sugar cane. You can see a family producing cakes made from sticky rice and brown sugar and another producing rice crackers with sesame seeds. You will see a family’s yard full of bamboo mats with pumpkin and sunflower seeds drying in the sun after being roasted with seasonings. Towards the end of your tour you will come across a family who produces “happy water,” a local rice wine that averages about 40% alcohol. Yes, you get to sample it. When the tour is over you are brought back to the table where you began and poured more tea. New snacks are added to the table, collected from your visits around the village. Then each person is brought a plate of fried tofu and a local sauce made from tomato, cabbage, garlic and a little bit of chili. It’s best to come hungry as you are offered a very generous amount of food. The tour is free and you are not pushed to purchase anything along the way. In fact, there is no shop. If you want to purchase something from a family directly you may, but you will have to ask the guide to facilitate the transaction. The products tend to cost 500 kyat for a decent sized bag, which is far cheaper than you’d find it in town. While they do not specifically ask for donations, there is an expectation that you will donate something at the end of your tour. Every bit helps. The village of Khaung Daing pools the money together to fund the local school, build roads, and generally improve the conditions for the villagers. The village is also moving towards being more ecologically sustainable. The Inle Lake ecosystem is very fragile and the locals are trying to protect it. Our guide showed us where they are now planting trees to harvest and replant for firewood, as they previously were deforesting the nearby mountain for firewood, which caused landslides into the lake. Firewood is used in the production of every product we saw in the village, so this initiative is a huge step toward being more environmentally friendly. One shop makes baskets and containers out of old tires. You can also see locals collecting cans and bottles to take to a recycling facility. Tofu Village on Inle Lake is definitely worth checking out. Depending on the day you may or may not see other tourists. The bike ride to reach Tofu Palace is beautiful, but you can also arrive by boat or tuk-tuk. Just ask our friendly team at Song of Travel Hostel to arrange a ride for you, or for directions if you’re using one of our free bikes.